Naturally, it was exciting to help organise its special regional launch recently at the Albury LibraryMuseum, and as you can see, I even made matching bookmarks to accompany the gorgeous art-deco design of the book. 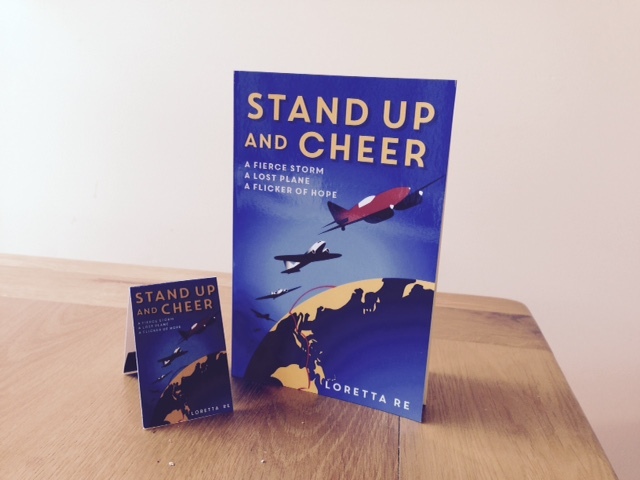 Did I mention that the book’s title is Stand Up and Cheer? And I’m proud to declare, with a possible hint of bias, that it’s a thrilling children’s novel based on a true gem of Australian history that we should all celebrate, namely the rescue, by the people of Albury, of the Dutch DC-2 plane, the Uiver lost in a fierce thunderstorm over the Riverina during the Great Centenary Air Race from London to Melbourne on the night of 23rd October 1934. 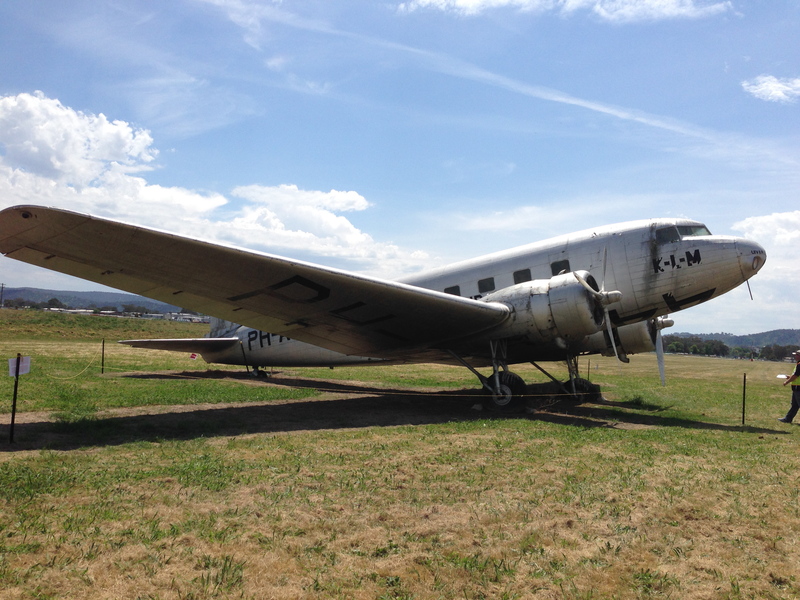 A Douglas DC-2, at the Albury Aerodrome during the Open Day in October 2014. Although not the original Uiver, it’s one of only a handful of surviving DC-2 planes in the world. Written for 8 to 12-year-olds, and enjoyed by everyone who loves an exciting and true aviation story*, Stand Up and Cheer is set in Albury at the height of the Great Depression and tells the story of the Uiver’s rescue through the eyes of the 10-year-old hero, Jack, the son of the local ABC radio announcer who plays a pivotal role in organising the townsfolk help the plane find a safe place to land. Of course, helping organise a book launch isn’t the only fun and frivolous entertainment to be had around books. A friend of mine was visiting her family recently in the Northumberland region of the UK when she noticed that Tim Winton, Australia’s highly decorated author, was reading from his latest book, Eyrie, at a small pub nearby. Not knowing how these events work, and concerned that she may be asked questions if she attended, she dutifully read the novel beforehand. Now apparently, Tim Winton isn’t quite as well known in the north of England as he is here, so only a small group of people turned up to listen to him read in a cosy, intimate setting. And my friend was the only one to have read his latest book and have thoughtful, relevant questions in mind. So that’s how she came to spend a marvellous evening chatting one-on-one with the charming Tim Winton on a cold night in the north of England. See how fun and frivolous activities can often lead to so much more? This entry was posted in Books, Music and Films, Family, Friends and Home and tagged Albury LibraryMuseum, Aviation history, Book Launch, Children's aviation story, DC-2, Eyrie, Great Centenary Air Race, Stand Up and Cheer novel, Tim Winton on December 31, 2014 by outsidethesquare101.